The Luthier Series C10SP from Cordoba is a nylon-string classical guitar, which combines the bell-like, clarion, and balanced tones of a European spruce top with Indian rosewood for the back and sides. Its mahogany neck, measuring 25.6" in scale, is outfitted with an ebony fingerboard and set to the neck in a Spanish heel joint. 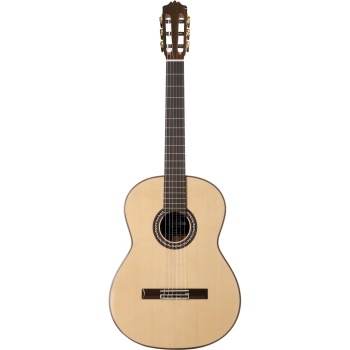 This construction imparts a warm, rich timbre and tight low-end response to the instrument. As such, this iteration of the C10 tends to have a more focused, projected sound over its compatriot, the C10CD, which utilizes a Canadian cedar top. 19 frets are provided in total with side-position inlays at the fifth, seventh, and ninth fret for easy visual orientation. A 4mm truss rod is accessible for ensuring that your neck stays straight, and a bone nut has been employed to bolster sustain and resonance on open strings.